Couples who are obese may take longer to achieve pregnancy than partners who aren’t as overweight, a recent U.S. study suggests. 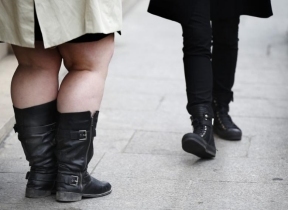 Previous studies in women have linked obesity to difficulties getting pregnant. In the current study, neither male nor female obesity alone was linked to taking a longer time to conceive, but when both partners were obese, the couple took up to 59 percent longer to conceive than non-obese counterparts. “If our results are confirmed, fertility specialists may want to take couples’ weight status into account when counseling them about achieving pregnancy,” said lead study author Rajeshwari Sundaram of the Eunice Kennedy Shriver National Institute of Child Health and Human Development in Bethesda, Maryland. “The benefits of a healthy weight are well known: obesity increases the risk for diseases such as type 2 diabetes, heart disease and cancer,” Sundaram added by email. Sundaram and colleagues focused on the relationship between pregnancy and body mass index (BMI), a ratio of weight to height. A BMI between 18.5 and 24.9 is considered a healthy weight, while 25 to 29.9 is overweight, 30 or above is obese and 40 or higher is what’s known as morbidly obese. Researchers compared the average time to conceive for couples where neither partner was obese to couples where both fell into the obese class II group. Couples in the obese class II group took 55 percent longer to achieve pregnancy than their normal weight counterparts, the study team calculated. After accounting for other factors that influence fertility such as age, smoking status, exercise and cholesterol levels, obese class II couples took 59 percent longer to get pregnant.